Join the Tofino Clayoquot Heritage Museum and Stephanie Ann Warner as she brings the stories of our pioneers to life in an evening of history and refreshments as we celebrate the opening of our new exhibit British Columbia’s War 1914-1918 and our special exhibit on Clayoquot Sound’s war experience. Guest curator and presenter Stephanie Ann Warner has been researching the life of her grandfather Harold Monks Sr., a Vargas Island “rancher”, cannery fisherman, wartime signaller, Lifeboat crew member and active Legion comrade. 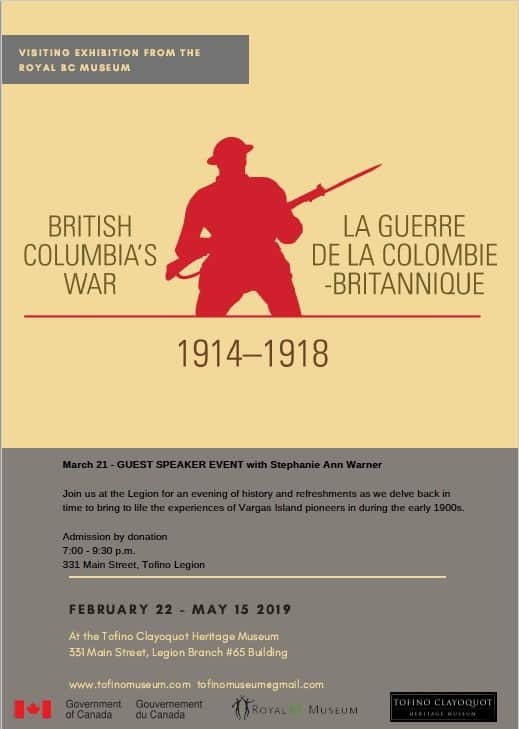 Stephanie’s presentation will use photos, historic documents, diary entries and memoirs to bring to life the experiences of Tofino and Vargas Island residents and how the First World War impacted their lives. Join us for refreshments in the Legion and visit our exhibit at the museum before or after the talk.